In the world of finance and superannuation we have to deal with some pretty complicated information. Investment returns, loan repayments, balance projections, tax rates, salary sacrifice, transitioning to retirement – it’s enough to make your head hurt (mine does, just writing about it!). For users who may not find finance and superannuation the most exciting things in the world, it’s important to find ways of presenting complicated information in simple and engaging ways. A great way to do this is by using interactive gadgets that give users information that’s relevant to them in a way which is visually engaging, easy to understand and yes, even fun. Think back to your high school science classes. Did you prefer doing experiments, or listening to your teacher drone on about theory? For most of us, we learn better by doing than listening, so the interactive nature of gadgets makes users more likely to pay attention to what you are telling them. Another brilliant thing about gadgets is how they personalise information and only provide results that are useful to the user. Rather than scanning through a table full of complicated figures, the user taps in a few details and voila! The gadget tells them exactly what they need to know. This combination of interactivity and personalisation results in a highly-engaged user who is more likely to retain information and continue their journey through your website. Calls to action (CTAs) can then be used strategically to encourage users to take the next step, and are a highly effective way to make the most of the traffic generated by the gadgets. Preservation refers to the age at which a superannuation member can begin accessing their super. Here’s how we presented this information for Industry SuperFunds. The gadget gives the user exactly the same information as the table, but presents it in a much more visually appealing way. It asks the user to interactively engage with the gadget so it can produce a personalised result. This is followed by a series of CTAs which relate to that outcome - firstly by being directed to a calculator which works out how much super they will need, and secondly by suggesting they improve their position by contributing more to their super. How much super am I on track to earn? 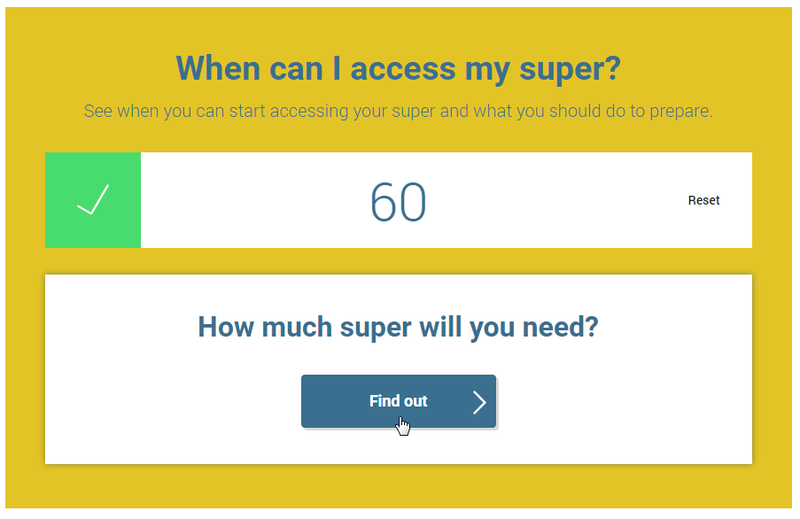 Is the amount of super I will earn less than the amount I will need? If so, I should contribute more. In the finance and superannuation industries, there are endless situations where complicated information needs to be presented to the user. Using gadgets and calculators are the best ways to present this information simply, without scaring the user away!